I'm trying to not repeat postings and instead focus on new things to add. I did a post on the Wilshire (introduced in 1939) over a year ago... Here it is. 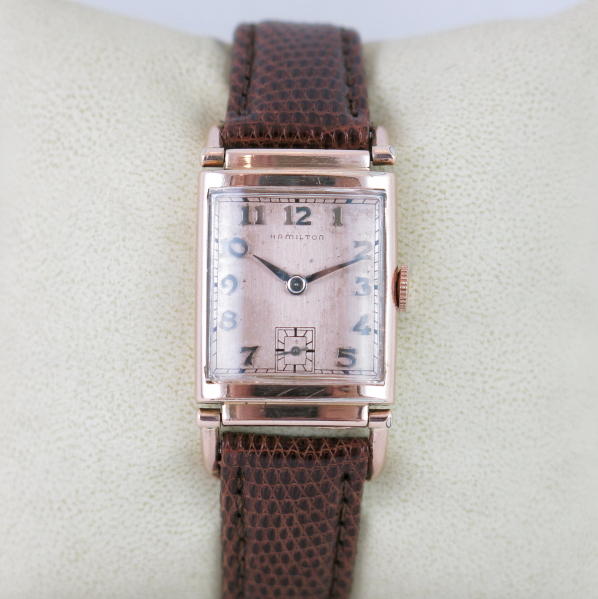 But since the Wilshire is one of several watches that were offered in "coral gold" in 1940 and 1941, I thought I'd make an exception. 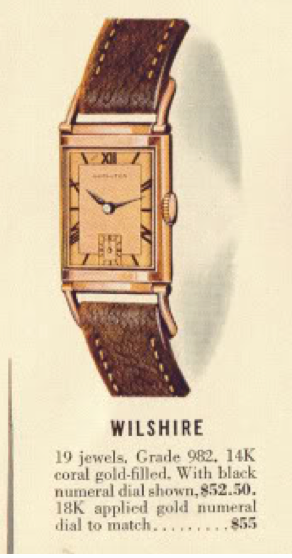 The Coral Wilshire was available with a black numeral dial as shown in the catalog, or an applied gold numeral dial where the numerals are rhodium plated to make them silver-colored. 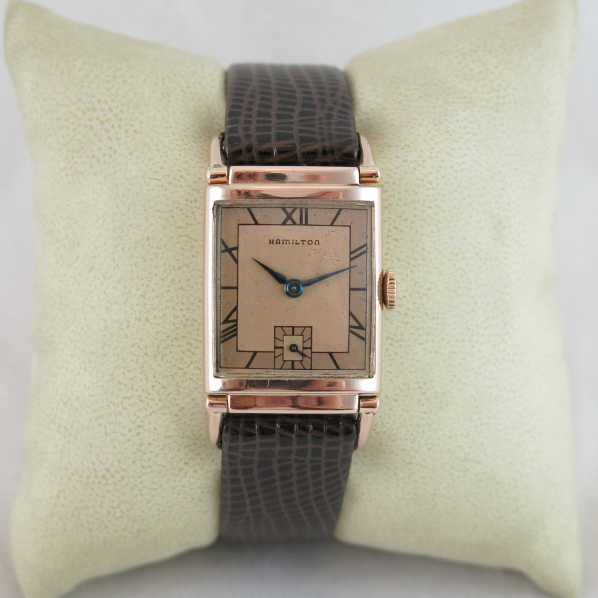 The 14K gold filled case is rose gold filled - which offers the watch a totally unique look. 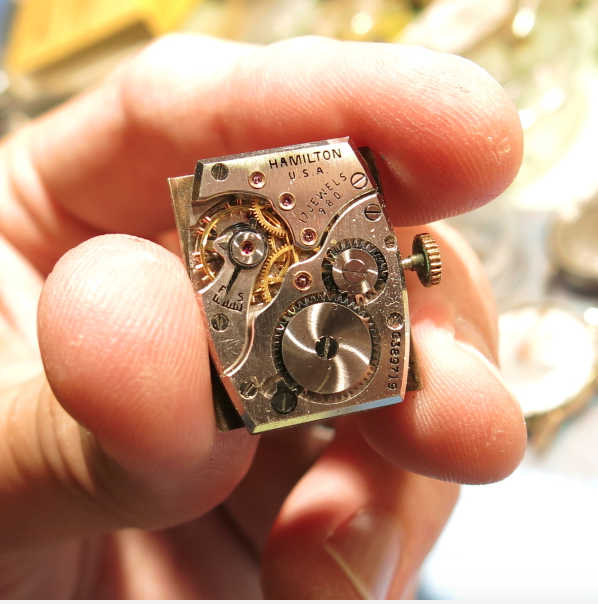 Behind the dial you should find a 19 jewel 982 movement. In the shot below, you can see the crystal really isn't a very good fit. In fact, there's an opening in the corner. 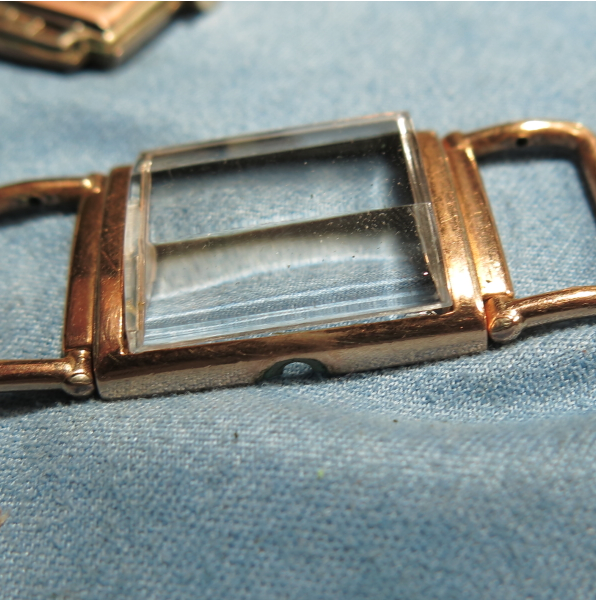 With an opening under the crystal, the dial is pretty dirty and a lot of lint has collected. Oddly enough, this watch is outfitted with a 980 movement. It dates to 1942 - close to 1941 I suppose but it really should be a 982. I'll have to look for a spare 982 to swap out someday. This watch was well maintained. 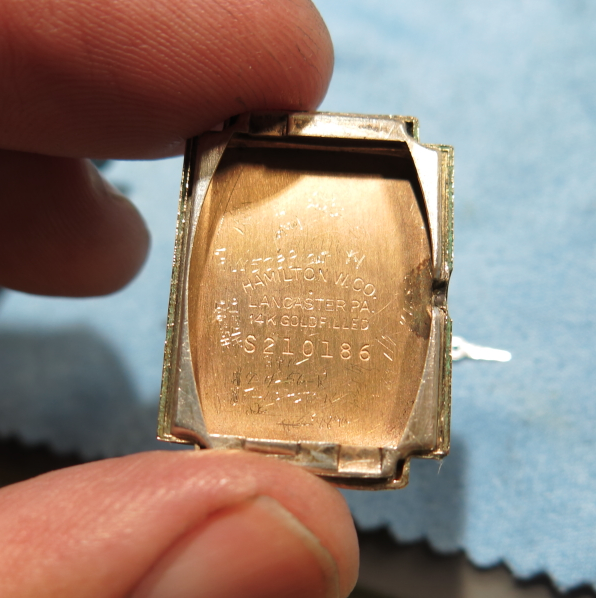 I counted about 20 watchmaker's marks inside so it was serviced quite a bit over it's lifetime. I'm not sure which is better... a watch that is well maintained like this one or a watch that was not maintained and perhaps stopped and sat in a drawer for 50 years. 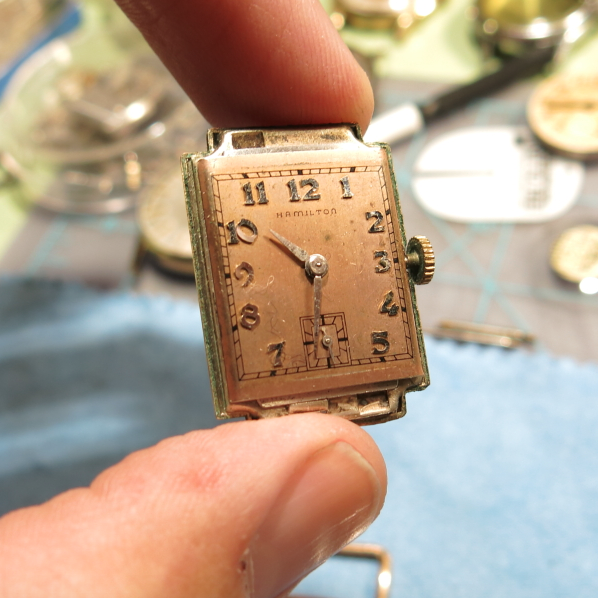 A well maintained watch has had a lot of wear to it. 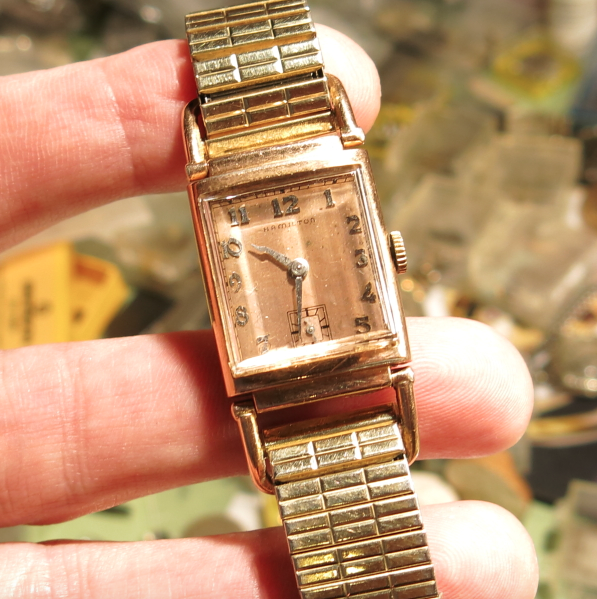 While a watch that has sat for 50 years has not been worn a lot - although there is probably a reason it didn't run. All cleaned up with it's running 980 movement, a fresh glass crystal and a nice lizard strap, this Coral Wilshire turned out pretty well. The dial is okay. It's original but a little faded after I cleaned off all the crud. I could get it refinished but it's not that bad. Here's a photo of the black numeral dial version as depicted in the catalog image. It's a striking model, in my opinion.